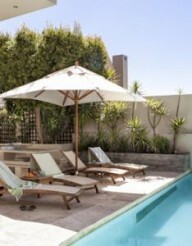 This beautiful contemporary styled modern villa is situated in wind free Fresnaye and has . This villa has 4 large bedroom and bathroom. A great outdoor area as well as a Jacuzzi. It is serviced daily. It is also a very child friendly villa with all amenities such as a fully equipped kitchen and lounge area. The patio opens directly onto the pool with a lovely bar and pool area. It comes with a an alarm system parking for two cars and off street parking. He villa is close to the waterfront and Clifton areas.